While some pieces come together with effortless synchronicity, others are a struggle from start to finish. This piece was definitely one of the latter, but I’m finally happy with the end result. There’s just something that really amuses me in the way it seems like a cross between Lovecraftian horror and a 12-year-old girl’s diary. The grey writing is done with a brush pen usually used for shading, the barely-legible words are a couple of especially creepy quotes from HP Lovecraft’s fiction. Blank spaces on the left were filled in with single words or shorter phrases, giving the whole thing a sense of mad, frantic writing, the deranged mind getting out what it’s seen. Or, possibly more insanity-inducing, the inner feelings of a pre-teen. The images themselves are layered, everything from printer ink to sharpie marker, watercolor to pen and ink. I used water to blur things left and right and there’s even a tiny bit of salt texture, though it doesn’t take very well on this type of paper. I considered adding some tentacle monster green into the mix to dull down the overall cheeriness of the palette, but in the end I couldn’t resist the juxtaposition of color and intent. 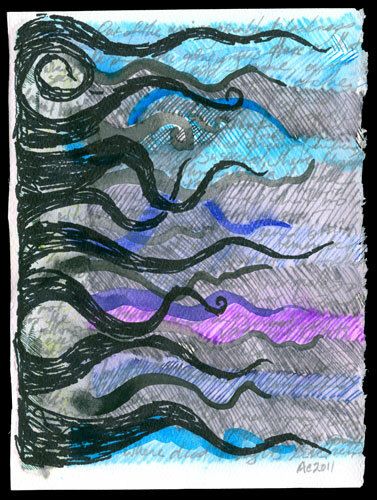 Lovecrafty, 5″x7″ pen & ink, watercolor, Sharpie marker and salt on paper.